"She's like a rainbow, coming colors in the air, oh, everywhere....she comes in colors"
12 repurposed very rare blank cassette tapes and one CD handcrafted into a super fun rockin' retro centerpiece light holding 20 battery operated multi-color mini LED lights. The very rare cassette tapes used have nothing printed on them, so it has a very sleek clean look. Most people do not realize the lamp is made from cassette tapes until they look closer or you tell them. The colors are beautiful and just enough light to be a nightlight or mood light in your bedroom or living area. You will "LOVE" it and so will your guests! This light measures approximately 4 inches long by 4 inches wide by 7.5 inches tall. I take great pride in the construction of my Cassette Tape Lights. The idea came to me last year when someone purchased a Vinyl Record Clock from me for her unborn son's nursery. It was a retro themed nursery and I thought "wow, what could I make out of cassette tapes for a retro themed bedroom, nursery, or even a party?" My first thought "every baby's bedroom needs a night light!!!!" So I got out some of my old cassette tapes from the early 90's and started experimenting. 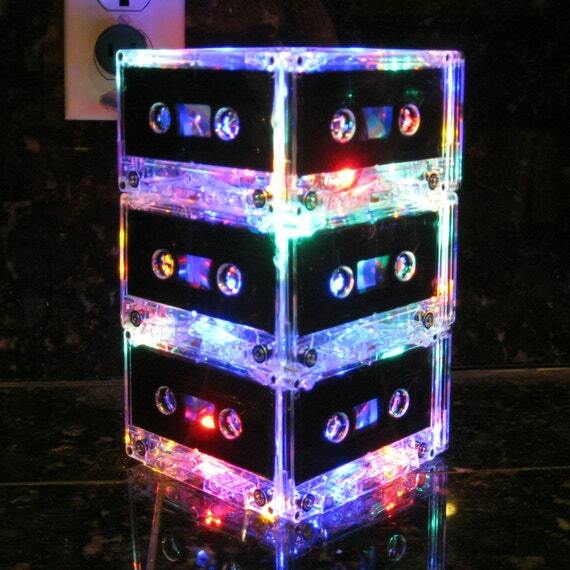 And the Cassette Tape Night Light Lamp was born! Ships out within 2 business days. Within the U.S. via USPS priority mail (2-3 days delivery). International orders will ship via parcel post. Please allow 15 - 30 days for delivery.